Veronica Gonzales was the first in her family to go to college. She also went on to law school, and she now helps thousands of others in Texas’s Rio Grande Valley find their own path. Anyone who questions how universities are beneficial to their local communities needs to spend time with Veronica Gonzales. The former Texas state legislator is now playing a big role in higher education in South Texas by overseeing programs that uplift both students and the communities they come from. Gonzales is the vice president of government and community relations for the University of Texas Rio Grande Valley (UTRGV). In this role, she works with legislators and other government officials on the local, state, and national levels to optimize the resources available to the school. She also takes a lead role with outreach programs, including community hubs that connect academic departments and students with community needs. Those needs include local economic development and healthcare services. “Services are tailored to the particular community,” Gonzales says. In addition to the largest campus in Edinburg, the university and its medical school have campuses in Brownsville, McAllen, Harlingen, Rio Grande City, and South Padre Island. So, based on needs assessments for the communities that house these hub sites, these services include providing financial literacy, assistance in applying to college, and guidance for applying for financial aid. In fact, the UTRGV School of Medicine even sets up mobile and stationery medical clinics in communities. The school’s Office of Community Engagement and Economic Development also provides a Nonprofit Resource Center and an Engagement Zone, which is an online portal that connects students with volunteer engagements. To fully understand how important each of these initiatives are to both the students and the area communities, it helps to understand the region that UTRGV serves. The population of the four counties that make up the region is roughly 90 percent Hispanic, and although the region was once primarily agricultural, it has now become much more urbanized; the education, government, and healthcare industries employ much of the population. Additionally, slightly more than half (54.8 percent, as of 2018) of Rio Grande Valley residents live below the poverty line. But that number is shrinking with recent economic developments. In a job such as this, someone with Gonzales’s legislative background is ideal for the task. She was also a practicing attorney for over twenty years, and she has never forgotten where she came from. When looking at higher education, Gonzales believes in the practice of what she calls “intrusive advisement,” which means having a community of professors and administrators that care about students and want to help them succeed. “We advocate for students to study abroad, to conduct research, and to engage in community service, among other opportunities,” Gonzales explains. To be clear, this is not a feel-good-just-be-happy-with-a-degree philosophy. UTRGV performs: BestColleges.com placed the university at number four on its ranking of four-year colleges in Texas. In 2018, the school’s chess team won the prestigious national President’s Cup—the same year that three UTRGV undergraduate business students bested five hundred other teams from thirty-seven countries to win the CME Group Trading Challenge, a four-week electronic futures trading competition. With students largely coming from low-income families, they often have fewer role models of academic achievement in their midst. In fact, more than half (52.8 percent) of students receive Pell Grants, and 68 percent receive some form of financial aid. Many come from one-car families, and UTRGV is still largely a commuter campus. Some students even cross the US-Mexico border to come to classes. With those facts in mind, Gonzales champions incentives for all UTRGV students to minimize their costs and post-college debt load. Tuition caps off at twelve credit hours in a semester, allowing students to take fifteen or eighteen credit hours at no additional cost and graduate early. And Gonzales says that students who participate in an early-college high school program or dual-credit courses are able to earn college credits while in high school, saving themselves time and their families’ money when they do go to college. And why wouldn’t they, given the role model they have right there guiding them on that path? Veronica Gonzales understands both needs and opportunities. Her father had muscular dystrophy, and as a legislator, she saw how Easterseals—a nonprofit that provides disability services to individuals living with disabilities—helps many people in her community. “I realized that the disease impacts not only the individual but the entire family,” she says. 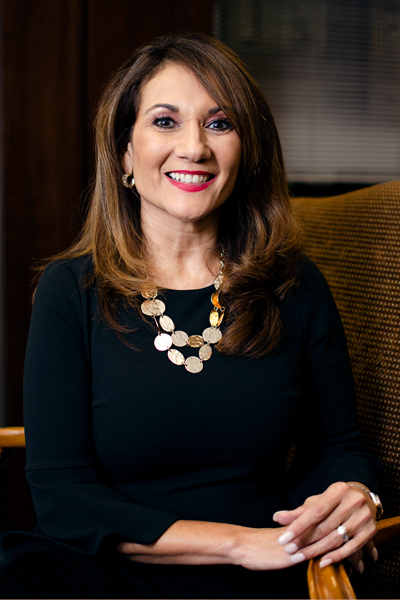 Today, she is the incoming president of Easterseals Rio Grande Valley, and UTRGV provides services through the organization as well. Her work with Easterseals, however, is not her only work to give back. With colleagues at UTRGV, Gonzales helped to establish Vaqueros Vote, a nonpartisan group that promotes voting and democratic engagement. She also serves on the board of a similar organization, the Advocacy Alliance Center of Texas, and she serves on several economic development boards and councils. “We must lead by example,” she says.